Since its inception, in 1995, Nomad Editing has built an enviable reputation as a creative editorial company with integrated CG, visual effects, graphics and sound design for commercials, Internet advertising and feature films. Twenty years on, the company’s operations have expanded from its Santa Monica HQ to encompass burgeoning operations in New York and London, delivering spots for the world’s biggest brands. Nomad relies on CatDV plus Akomi to keep its massive and ever-expanding volume of assets alive for 24/7 review and reuse. Nomad collaborates with leading advertising agencies, including Media Arts Lab, Wieden + Kennedy, TBWA, Ogilvy & Mather, Leo Burnett and BBDO, for a multitude of global names, such as Starbucks, Bridgestone Tyres, Pepsi, Honda, Hyundai, Nissan, Toyota, Lexus, American Express, Facebook, Visa, Nike, Samsung, T-Mobile… the list goes on. Noted directors Traktor, Kinka Usher, Sam Beyer, Michael Bay, Frederik Bond, Dayton/Feris, Gerard de Theme and Guy Ritchie have all collaborated with the Nomad team on spots seen around the world. The company has a strong relationship with Bruckheimer Films and has worked on feature projects with DreamWorks, Disney, Warner Brothers and Fox. 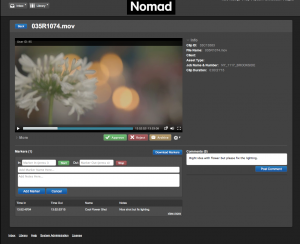 Over the years, Nomad editors have also worked on hundreds of music videos for high-profile artists including the Red Hot Chili Peppers, Madonna, Tom Petty, Michael Jackson and Bon Jovi. However, things changed as Nomad began to grow with additional clients, new operations in New York and London, and a dramatic increase in the size of original RAW media it was starting to handle from the then new breed of digital cinematography cameras. “What’s more, with the blossoming of the Internet and mobile telephone communications, clients became accustomed to faster gratification of their requests – they wanted and expected to see their media much quicker,” he explains. “Our existing LTO-tape system was getting swamped, finding media was in danger of becoming a guessing game, and that can reflects badly. However, with the business going from strength-to-strength, generating in the region of 10TB of assets per month at its LA HQ alone, Poletto says that this installation soon needed to be up-scaled. Furthermore, as the company was increasingly sharing projects between its LA, New York and London operations, serious consideration was needed as to how media asset management could best support international collaboration, whilst maintaining the security of the assets. “For a small company we generate an outrageous amount of media,” he says. “Along with high-resolution RAW camera rushes, plus 4K DPX, CG and VFX files, we also create many different versions and lengths of each commercial, as well as wide range of deliverables for different distribution platforms. Whilst all of that media needs to be archived safely to LTO, only a certain proportion needs to be instantly searchable – mainly low-rez proxies of the rushes, work-in-progress and final commercials. 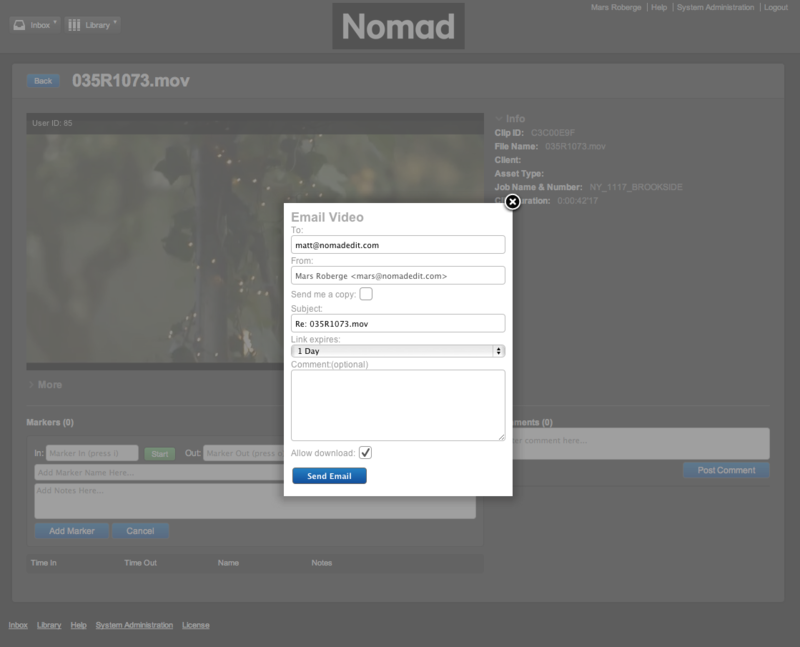 In most media management workflows, assets in the MAM system are sent to archive after a project is complete. However, to handle the high-asset count at Nomad with optimal efficiency, the assets for a project are archived to DNA Evolution first and, through middleware developed by North Shore, only the required media – proxies of rushes and completed jobs – plus associated metadata, are parsed to CatDV. 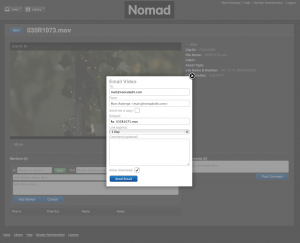 Along with client-side search and review, Nomad is also using the elegant integration of CatDV with Akomi to enhance creative collaboration between its three different offices. For example, a cut made in by an Adobe editor in Los Angeles can be dropped into an Akomi folder and rapidly published to multiple recipients for viewing and annotation using CatDV Worker Node.